I hope to be one someday! I’ve been thinking a lot lately, about the food I eat. Sounds strange, huh? Most of you don’t know this, but I’m not a vegetarian or vegan, but I really believe in it, you know? I believe in not eating meat because I truly love animals, but for some reason that’s not enough. I don’t mean to say that creatures aren’t important enough, no way! Animals are just as important as us, if not more! The thing is, I don’t think I’m ready to take on this task yet. What I mean byt that is, I’m neither mentally or spiritually ready to do this for myself. I know if I were to try this now, I would fail. And not just fail, but make myself feel terrible and unable to try it again because of it. I need to makes sure that I’m ready and that I’m able to dedicate my soul to it. I hope I’m able to do this when the time is right. Well, I know I can do it! I just hope I follow through with it. 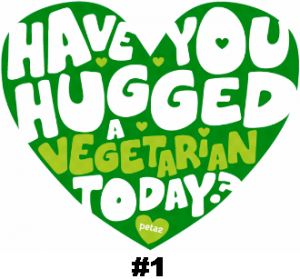 Much love to you all, and I give my upmost respect to those of you who are vegetarians/vegans! I Love you all! I am vegetarian, I took a break, if you can call it like that, for about 2 years. I stopped eating animals when I lived with my dad and I had to cook every night (my parents got divorced). I always wanted to quit eating animals, but I don’t want to bother others with my decision, so I started when my mom left. My dad didn’t mind, so that was great. Thenafter a few years I bought a house with my boyfriend, a real meat eater (he loves animals though, we have 3 cats, 2 guinea pigs and 7gerbils :P), and because I have a metabolic disease I don’t have a lot of energy so it was too hard to cook different meals every night (that was my excuse :P). A year ago I quit eating animals again because it just didn’t feel right and I didn’t feel healthy anymore. I’m glad I did and I don’t miss it at all. My dad’s new girlfriend asked if I don’t miss it, when I cook my boyfriends dinner (because it’s suppose to smell good), but I don’t. I actually started to hate the smell of it. It’s funny, because the first time I stopped eating animals, I really did like the taste of it and I cried sometimes because I missed it so much. Maybe that’s why I started eating it again, I just wasn’t quite ready. First off you are adorable :} I am a vegetarian as of early 2011. I never did it for the animals (Although I love them!). I grew up eating meat with every meal but out of the blue I just started losing my appetite for meat. First it was Steak, then anything ground beef, NEVER liked pork (expect bacon :p), then i couldn’t do chicken anymore and last meat I stopped eating was bacon. I held onto bacon for awhile lol. I remember the day I stopped eating chicken, I was driving down the interstate and come upon a semi packed full of them, I wanted to puke, the smell and the look of those birds being jam packed and hauled off to have their legs and necks broken then butchered. This is how bacon left my menu too, truck load of pigs. Ahhh thank you so much! I absolutely loved reading all of what you’ve typed! That’s really a great story, and very inspiring for myself. (: I sort of see myself in you! I’ve been slowly cutting down meats. So far, I’ve pretty much got chicken, turkey, steak, and pork (I never liked pork either :p or steak) off of my menu!I also really love bacon, and sadly burgers. So it’ll definitely take time, but I think someday I’ll be able to do it. Thank you for reading, Liz! Much love to you! I believe in eating meat. I believe in the circle of life. Most of us wouldn’t question a dog, or a cats need to eat meat, and Humans are no different. Humans are omnivores, we need meat, and as animals in the food chain, we have the right to it. Factory farming is criminal, and I know I am lucky coming from a country where only chickens and pigs are subjected to it (I would NEVER eat that meat), but healthy, humane hunting and farming are the most natural ways to live and eat. If you are considering vegetarianism, that is fine, but please, make sure you have read plenty of sound material on the other side of the argument. It took me two years as a vegetarian almost vegan to come to this conclusion, but now I feel healthier and stronger than before, with a better connection to animals and life in general. I understand where you’re getting at. You got me really contemplating now. I find myself agreeing with everything you said as well. I’m happy to hear you made this choice for yourself though! All that matters is that you’re happy and healthy in the end. I’ll definitely think about what you said, and keep it all in mind. Thank you so much! I was vegetarian all last year up until early October. I’m only 15, and before I went for 9 months, I was veggie for weeks at a time. It takes getting used to and I think its okay to fail and then rebound, I did it plenty of times. I’m back into it and plan on staying just because I don’t think it’s right to take anything’s life. Last year, I started eating fish for protein and because I love it but this year I’m staying away. I just want you to know that I admire you and how you live. I want to be more like you. I tend to be too lazy to make changes that need to be made. Also, you and I have quite a bit in common. I’m pansexual, agree with your religious beliefs(I think), and am growing my hair out for natural dreads! I’m a guy so it will take a while but I’m pretty excited! I”m planning on making and putting in clip-in extensions and dreading them but I don’t feel as connected as I would if it was my own hair. Thank you much for your opinion giving! Kamaste! Wow, that’s so wonderful! You admire me? I admire you! To be able to do that, and stick with it. Yes, as you say, you have tried it many times, but you never gave up. You’re sticking with your beliefs and following your soul. Now that’s something to be admired for. Don’t be more like me, be more like you. You know who you are, deep down. It just takes time to find. I was just lucky to find it at such an early age. I can already tell that you’re not going to have a problem with finding yourself though! I’m excited for you to grow your natural locks man! You’re going to love it Thank you for reading! Shalom! Just started reading your blog, and I like it a lot! You have a lot of interesting subjects to talk about and also I love the dreadlock videos. Its really inspiring to see. I am growing my hair out at the moment so I can eventually let my hair lock up, and yours are the first videos that made me reconsider trying the natural/neglect method! beautiful! I was vegetarian for a couple years in high school and then went vegan for about 6 months and then back to vegetarianism again. I just started eating meat again about 6-7 months ago, and I did it because my body was calling for it. It was purely out of what I felt my body needed to keep going, and I couldn’t sustain myself on a veg. diet alone. I still eat mostly vegetarian and supplement my diet with some chicken and occasionally some beef and fish but I almost always try to eat animal products that are sustainably sourced and healthy. For example, I always buy chicken that hasn’t been treated with hormones or antibiotics, and I always buy local grass-fed beef. I feel this is easier on my body not only physically but energetically. think about what those animals were going through, how they were living their lives before they were slaughtered for us. The more peaceful and natural their lives are in general, the healthier their meat will be for consumption. Thank you!! I tend to get lazy with typing out different blogs though.. because I hate typing. I’d much rather talk, or actually write on a piece of paper. I despise technology! But than kyou so much! I feel honorned to be the one that insspired you, really. Much blessings for when your journey begins! That’s an inspiring story! It’s so cool that you were able to try and find out later that it wasn’t for you. You tried it.. that’s why it’s so beautiful. That’s too bad that you couldn’t stick with it! Your heart and soul is in the right place, so don’t forget that, love. I completely agree with you though. You need to make sure that vegetarianism is going to bennefit you.. not cause more damage to your body! You need to be happy and healthy. I’ve started vegetarianism when i was 6. Now i’m 21 and i feel comfortable with myself, i do not have any healt problem. People say “i love anymals” and for “animals” they mean dogs and cats, stop. But animals is so much more. None of my friends is veg and i don’t criticise them but being veg is something i can’t get along without, that’s me. Hi, very interesting blog you’ve got. I’ve been vegetarian since I was about 12, now 22 so 10 years now with only a couple weak moments. At first I did it for the animals and then after awhile my thoughts and views changed, I loved animal but also thought its the food chain really, animals are meant to be eaten and I didnt really knew why I was a veggie, I was just use to it, prefered it. I couldnt find much justification for it. Now, as I’ve gotten older and (hopefully)maturer, I know why I am veggie and very proud to be one (well I dont go parading around annoucing it nor preaching others, but I dont plan to change it) Especailly with myself and society coming into light about the food industry, in particular the meat industry, its disgusting, the animal cruelty, the nutrirtional value (or lack of) and how it drains our resources, its a gas guzzling affair! Not exactly the most greenest way to eat (although soya is somewhat worse..). So I think now I have loads of reasons why I’m veggie, like lower the demand to reduce the supply, ethics, morals, health and back to my previous statement about the food chain, if our society is so adavance and we have evolved so much then we can deffiantly reduce our meat consumption and put more room in our hearts for animal companions. Wow, that makes so much sense! Everything you said, I understand and agree with. I knew it’s not just the animals that makes me want to be a vegetarian, it’s the society we live in. I admire you a lot, man. For following through with your beliefs/values, and standing up for what you believe in. I hope some day to be as confident and strong as you are. I’ve never heard of a Flexotarian before, but that’s very interesting! Thank you for reading and commenting, it truly means a lot to me. Much love to you. I’ve just hit my 3 year anniversary of no meat (originally vegan, now a vegetarian) and my 2 months of dreads. And from my experience, I’d say to hell with it- just stop eating meat, watch peta videos and go with it! I’ve done some soul searching in my time (I’m only 23, mind you, so not too much soul searching) and I think that the biggest set back in many people’s minds about not eating meat is the label of it: VEGAN/VEGETARIAN. And this label seems to come with a ton of emotional baggage. It’s like you not just trying to change your diet, you are simultaneously changing your religion, political view, and rebelling against any and every entity that prepares, raises, kills, and or consumes meat. This is not an easy task, no matter who you are. But it shouldn’t be that way- it’s way too much pressure. And if you really feel that it is something you would like to try or do, I say go for it and don’t identify as anything. After all, you could just start out telling people you are cutting down on meat. No pressure, no rebellion… no judging. And if you would like to, later on you could adopt more of the vegetarian customs… such as hating the site of meat (one that I have recently adopted). Honestly, I do consider my vegetarian diet to be my religion. It is very important to me, and I do take it pretty seriously. But, I didn’t at first. The first year for me, I still wanted to drive my car down to the greasiest burger joint in town and stuff my face full of all things with faces- but eventually I came to find that idea repulsive. It all starts with baby steps. Like my grandpa used to say: “When the forest is on fire, start spraying water on the tree nearest to you, and don’t stop until you are through.” Well, actually no, my grandpa didn’t ever say that, but you get the idea. To think big, means to act small and expand over time. Good luck! And do your research before you begin, just to make sure you are still healthy (aka: salads are not the only thing you can eat). My god, 3 years?! That’s remarkable!! Congratluations, Chelsea! Everything you say makes a lot of sense. I’m already telling peoplethat I’m cutting down on meat products! I don’t know if I’ll ever fully cut meat products from my diet though because my body really needs protein. I’ve found that when I stop eating meat for a long period of time, I get sick easily. I can’t say I’m fond of that, but it’s okay. I’m just happy to say that I don’t eat as much meat as I used to. I’m really happy to hear that you’ve found what you believe in! At such an early age, too! Take care, and happy journey to you! I was born and raise up in 3rd world country. Unfortunately, the majority religion in my home country value animals as lower than human. So many animal cruelties. I can’t stand it anymore and decided to move to Canada. It is a relieve to see many dogs so happy here (eventough, there are some animal cruelty cases here and there…bad people always exist in every countries). I saved that videos just to remind me to achieve my goal to be a 100% vegan. I hope you could achieve your goal too. I am so sorry to hear that.. You’re right. No matter where you go in the world, there will always be indecent human beings (putting it nicely), but there’s not much we can do about it. All you can do is control your own actions! Hopefully impacting other peoples lives, so they follow in your foot steps. You’re a good soul. Please though, don’t torture yourself by watching those video’s.. You are doing what you can.